he last half of January 2016 has been a turbulent time for Oriental. In the middle of the month, Walmart announced it was shutting all 102 of its Walmart Express stores, including the one just outside Oriental. Then, as fast as an express train, a mere 14 days later, the stores closed. What this meant on the ground in Oriental was that a town that had 2 grocers as recently as October, suddenly had none. Two weeks notice. TheWalmart Express on the edge of Oriental was open 20 months until January 2016 when Walmart announced it would close all 102 of their “pilot” Express stores. It shut its doors on January 28. The Walmart Express had opened just 20 months earlier in May 2014. The 4-decade old independent grocery, Town-n-Country, hung on for almost 18 of those months. But overwhelmed by the competition, T-n-C called it quits in late October 2015. TownDock.net has been covering the Walmart Express shutdown story since news broke in national media on a Friday morning halfway through January. We’ve now compiled all of TownDock.net’s home page coverage on the saga, here. We start with mid-morning on January 15. 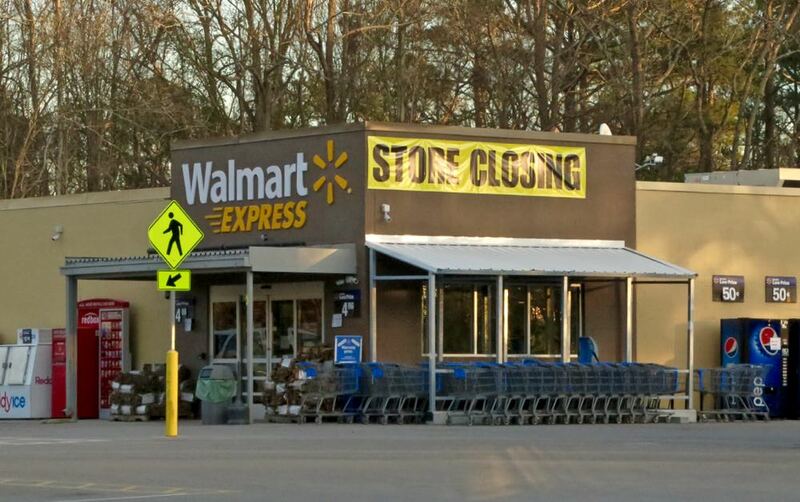 10:23a In national news this morning, Walmart is closing all of its WalMart Express grocery stores, ending its experiment in to small box retail. One of those 102 experiments was right outside of Oriental where a WalMart Express opened in May 2014. Town Hall says a representative of WalMart did try to contact the mayor yesterday. WalMart’s 20-month experiment in Oriental had an impact, just as its closing will. Walmart Express had been open since May 2014. Just before it opened in 2014, WalMart outbid a potential buyer for the town’s one pharmacy after pharmacist Ed Denton died. With the WMExpress closing, Oriental will be without a pharmacy. When WalMart Express opened as a food store, another grocery, Town-n-Country, had been in business for more than 4 decades. But WalMart’s competition was too great and the independently-owned grocery shut down last fall. When the WME closes Dollar General and its food shelves may see more shoppers. The Provision Company has recently started selling fresh local produce, dairy and organic meats. 11:55a In Oriental this morning the headline and topic of conversation is that the Oriental WalMart Express is closing January 31. That news came today as WalMart announced it was ending its small store experiment – or as a WalMart release put it, Walmart Continues Sharpened Focus on Portfolio Management. 1:58p Walmart in Oriental was a contentious issue from the start, back in August 2013 when the plans first emerged. Some welcomed it, some worried and fought it. 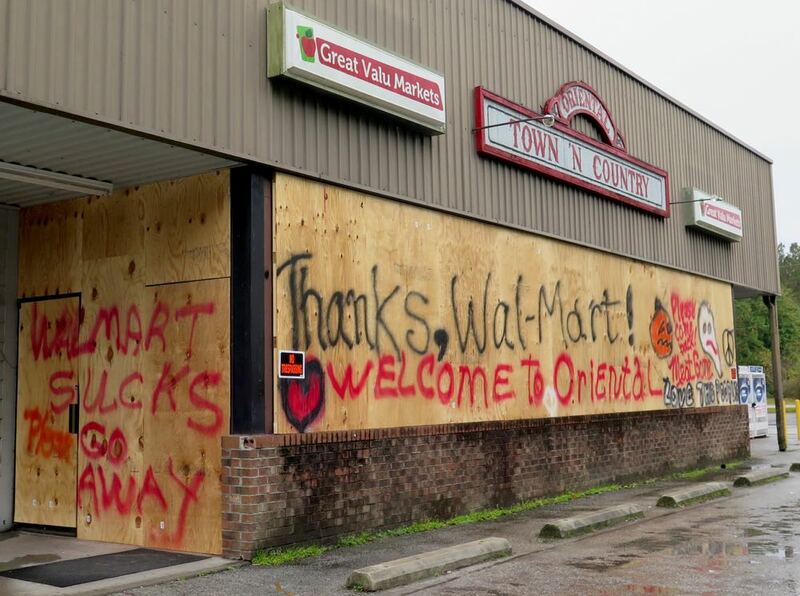 Just days after thr Town-n-Country closed with plywood over its windows, graffiti writers hit on Halloween night, their message blaming Walmart for T-n-C’s demise. The graffiti would remain until late January. Meanwhile, in Letters To The Editor, Carol Small writes that she’s not surprised. 2:20p January 28th. That is the official closing date for the WalMart Express just outside of Oriental. Earlier report., from an employee meeting this morning, had the store closing on the 31st. But the official list from Arkansas HQ has store #7207 closing January 28. 2:31p While it’s called the Oriental Walmart, the building is just a few hundred yards outside of the town line. Two years ago, Walmart balked at being annexed in to town where it would be subject to Oriental’s zoning and GMO and property taxes. Walmart refused, even though the Town Board allowed it to tap on to Oriental’s water and enjoy the services of the Oriental police who are funded by Oriental property tax payers. The Town Board said Walmart agreed to pay the Town a sum equivalent to what it would pay in property tax if it were in town. Last year was the first year Walmart would have had to pay Oriental those few thousand dollars. We checked with Town Manager Diane Miller. She says Oriental has gotten no payment. It was due by Dec 31. Not only has there been no payment, there is no piece of paper binding WalMart to make that payment. When TownDock.net asked the Town to provide a copy of the agreement when all this was being arranged back in 2013, Town officials at that time (prior to Manager Miller) said the retailer didn’t want it in writing. 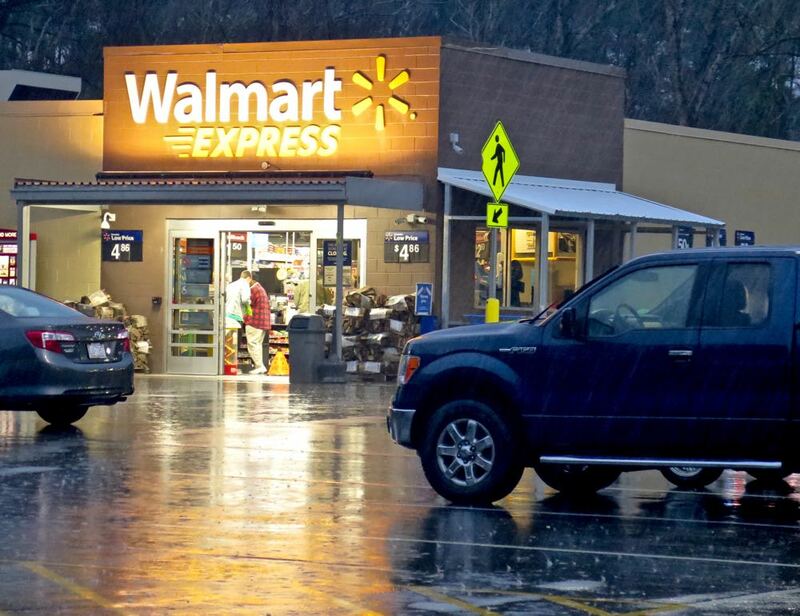 (If it were in writing, this story went, it could be a template for other towns with Walmart stores just outside their limits to get some compensation.) So Oriental’s officials acquiesced to this Walmart demand to keep the agreement unwritten. Again, the Town’s received nothing.